Visitors are welcome to use Logue Library any time we are open. All we ask of those not affiliated with the College is that you sign our guest book and leave a photo ID at the front desk while you are here. In accord with Chestnut Hill College’s mission to provide a holistic education in an inclusive Catholic community marked by academic excellence, Logue Library proposes to offer the college community excellent information services by means of all appropriate media. The library staff has the primary responsibility for designing, developing, organizing and maintaining the collection, services, and facilities that support this effort. 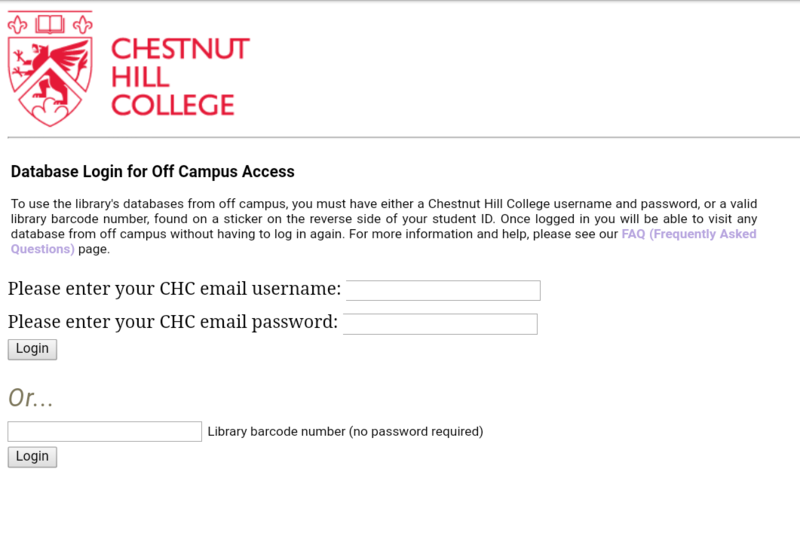 Please note that access to many of our resources is limited to the faculty, staff and currently enrolled students of Chestnut Hill College. If clicking a link presents you with a page like this, enter your CHC email username & password OR enter your CHC ID number (your CHC ID number is now your library barcode number) in the appropriate boxes.